As much as we love to rant and rave about the heroes of the DC universe, the villains have equally captured our attention and imagination over the years. They have a long and distinguished history on the silver screen in their own right. We’ve speculated quite a bit about the potential villain of Justice League Part One, but nothing could have prepared us for this new development. We have just learned that the Justice League Part One villain may in fact hail from Apokolips, but it won’t be Darkseid – at least not at first. According to a new report from Birth. Movies. Death., it seems Justice League Part One will opt for a somewhat more obscure villain for the DC team’s first outing together. Instead of Darkseid or Brainiac, the first Justice League movie will seemingly pit the group of iconic heroes against Steppenwolf – no, not the 1970s rock band. 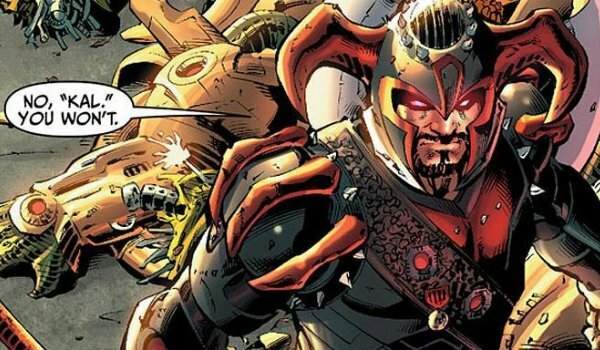 Although he is most certainly an obscure character from DC lore, Steppenwolf holds the distinction of being a military leader from Apokolips, a member of the race of New Gods, and the not-so-nice Uncle to Darkseid. He’s a powerful, imposing figure known for his use of an enormous battle-axe, as well as a high-tech hoverbike. Although he doesn’t have a history with the Justice League on par with other iconic villains, his New 52 continuity has shown him fighting the DC heroes on several occasions – which seems to line up with the DCEU’s continued embrace of the New 52 lore. So it seems that when Lex Luthor rang the "bell" during the events of Batman V Superman, the "he" that he referred to when speaking to Batman was not Darkseid, but his uncle. This likely indicates that Darkseid will have a definite presence in Justice League Part One, but his position as big bad of the franchise is being saved until Justice League Part Two. It seems that Warner Bros. has decided to dig deep into the DC mythos to draw the first villains for Justice League Part One. Ultimately we think this could turn out to be a good decision, as rushing Darkseid to the center stage too early could be seen by many as an attempt to emulate Marvel’s work with the Mad Titan, Thanos. We will just have to wait and see how things pan out with Steppenwolf as the potential first villain for the Justice League. Although he’s not as beloved as someone like Brainiac, Amazo, or even Darkseid, he still has plenty of potential to pose a world-ending threat. Justice League Part One will hit theaters on November 17, 2017.